Summary: Learn how to use PPC experiments to optimize the performance of your Adwords campaigns. In this dental case study we lowered our cost per conversion by 15% and improved our overall conversion rate by 7 percentage points, squeezing more leads our of our budget. Continuing our ongoing series on PPC optimization, this time we look at PPC drafts and experiments. Drafts and experiments lets you propose and test changes to your Google Adwords search and display campaigns. Using experiments you can optimize the performance of your campaigns to squeeze more leads our of less spend. 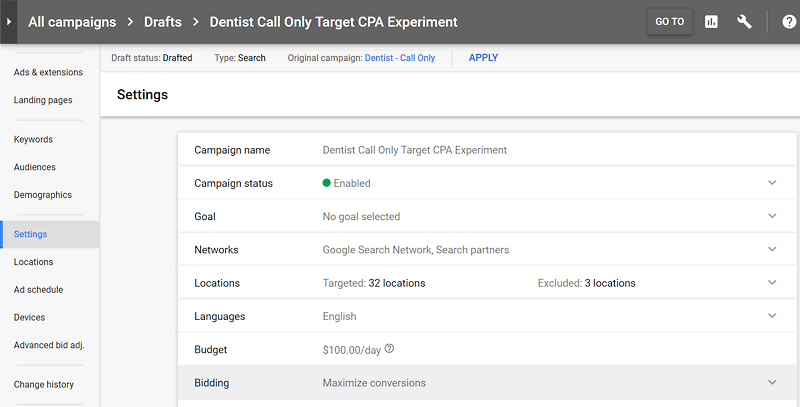 This article shows how to set up a PPC experiment for a dental client. 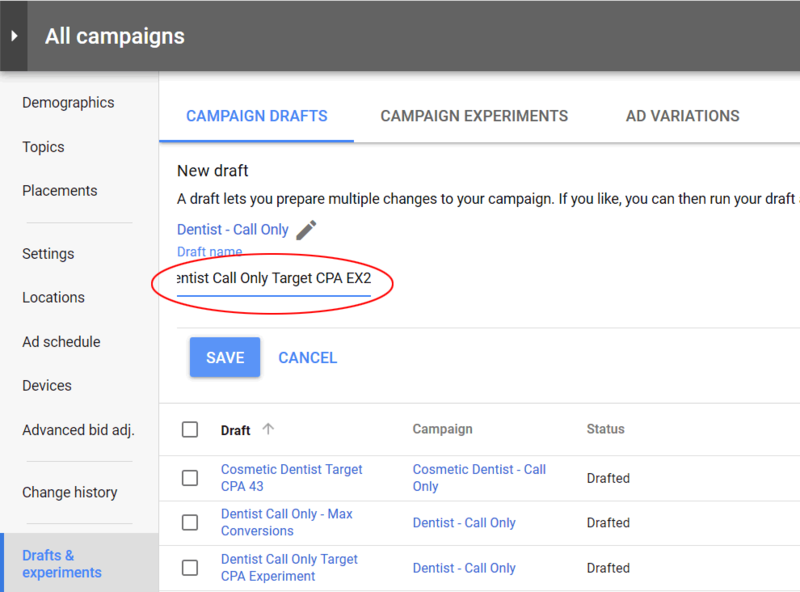 In Google Adwords, you can propose and test variations to your campaigns usind drafts and experiments respectively. In a draft, you can prepare multiple proposed changes to a campaign without impacting its performance. You can either apply the draft changes back to the original campaign or use your draft to create an experiment. Experiments allow you to measure the results on a portion of your campaign budget to understand the impact of your changes before applying them to your campaign. 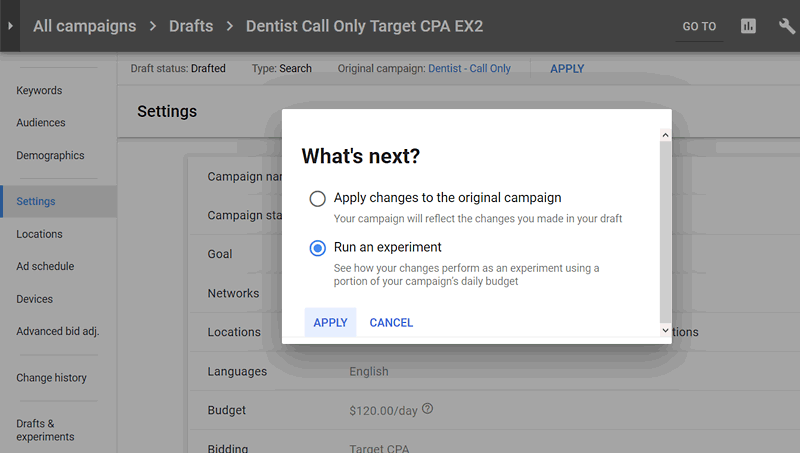 As you'll see below experiments allow you to devote a percentage of your campaign budget to the experiment, as well as a percentage of your campaign budget to the original campaign (defaults to 50%). After a suitable amount of traffic, conversions and time, you can see which campaign wins (for various metrics including cost/conversion, CTR, and conversion rate). If the new experiment performs better, you can Apply the changes to the original campaign. 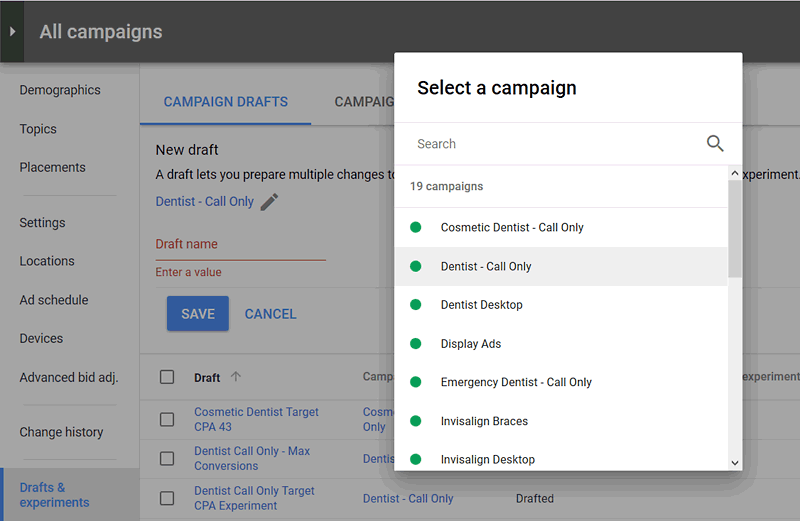 In our example, we had a Call Only campaign running for a dental client (PhillyDentistry.com) which targeted broader keywords like "dentist" and "dental office." The campaign was initially setup using "Maximize Clicks" to gather enough data. After getting enough data we ran an experiment that showed "Maximize Conversions" would improve performance (more calls for less spend). 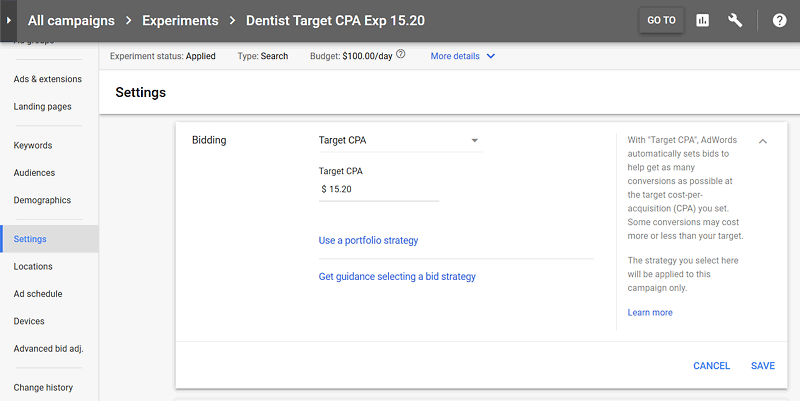 We wanted to see if another bid strategy would provide even better results, after consulting with Google we tested the "Target CPA" bid strategy. The first step in running an experiment is to set up a Draft. A Draft in Google Adwords is a clone of the selected Campaign, with one or more changes made to the campaign copy. 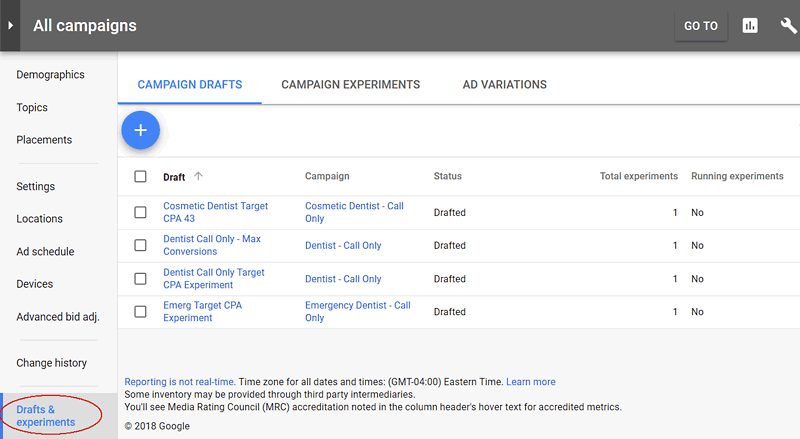 In the new Adwords interface first select the campaign that you want to set up an experiment for. Next scroll down the left vertical menu under "All Campaigns" and click on "Drafts & Experiments" (see Figure 1). Make sure you've selected the right campaign (see Figure 2). Next name your Draft (see Figure 3) with a short descriptive name (i.e., "Dentist Call Only Target CPA Exp"). Next select the draft just created and click on Settings in the left vertical menu (see Figure 4). In our case we want to test changing the bid strategy from "Maximize Conversions" to "Target CPA." Click on change bid strategy and select "Target CPA" (see Figure 5). We used the $15.20 Target Cost Per Acquisition (CPA) that Google recommended. Hit Save. The bid strategy is the only change we made for this experiment. Next open up the Draft and select "Apply" (see Figure 6). Select "Run an experiment" and the new experiment dialog pops up (see Figure 7). Set your starting date (defaults to tomorrow), end date, and experiment budget split (defaults to 50%). Let the experiment run for a few weeks (depending on how much traffic and conversions you have) to get meaningful results (see Figure 8). Google automatically calculates the statistical significance of your results with little arrows next to the results, but we've found that you can use some results like cost per conversion and conversion rate before the arrows appear. 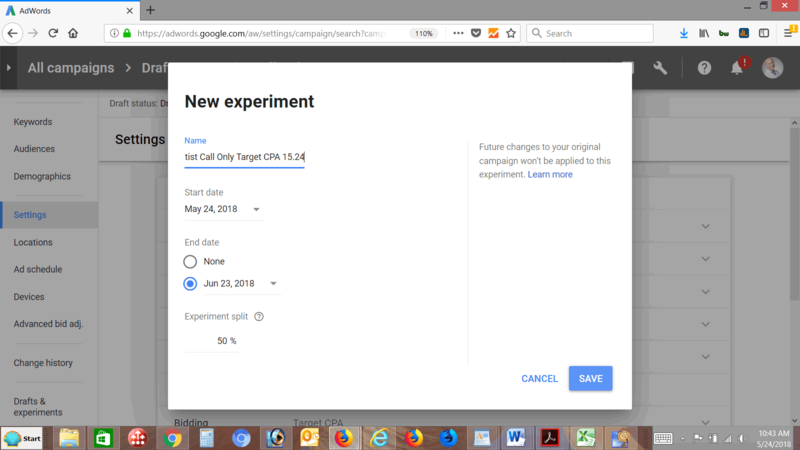 We prefer the old Adwords interface for experiment results as it shows both the experiment and the original campaign results in one table (see Figure 9). The new bid strategy proved to be a winner. Target CPA beat Maximize conversions by 15.4% for cost per conversion $14.01 vs. $16.56, and had a conversion rate 7 points higher than the old campaign (45.09% vs. 38.07%). We got the same number of conversions for 15.5% less money. We applied the experiment to the campaign to update the bid strategy. 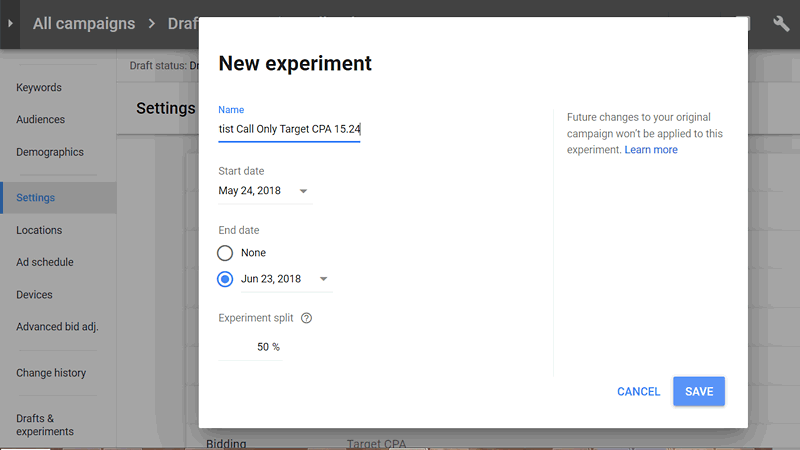 AdWords experiments allow you to test one or more changes to your campaigns at low risk by using only a portion of your daily budget. The original campaign runs parallel to the experiment, may the best tweak win. In this dental case study we lowered our cost per conversion by 15% and improved our overall conversion rate by 7 percentage points, squeezing more leads our of our budget. Philadelphia Dentistry was the subject of this case study. Thanks again to Dr. Ken Cirka for permission to use his PPC campaign as an example.